Interested in applying for the Worcester organ scholarship? Recent graduate DANIEL MATHIESON, now organ scholar of Salisbury Cathedral, reflects on the unique aspects of being an organ scholar at Worcester. Daniel Mathieson (at left) at Formal Hall after a service. 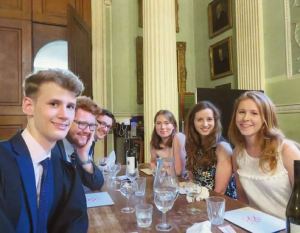 The organ scholarship at Worcester College is a unique opportunity to spend three years as an organist, director and so much more in a welcoming and supportive community. I came to Worcester with little experience of choral music, having not been a Cathedral Chorister or had a gap year. Worcester taught me the importance of throwing myself in at the deep end and not to be afraid of failure. This ‘can-do’ attitude is a core aspect of the Worcester community, demonstrated by the huge range of opportunities available to organ scholars. From regular commitments such as rehearsing the boy choristers and accompanying both choirs in services, to special events such as annual tours, recordings and concerts, there is never a dull moment. The options to tailor your time at Worcester are second to none: conducting the choirs, performing with ensembles and the wider college music scene, and working with contemporary composers in new commissions are just some of the ways I was able to make the most of my time at Worcester. For me, this gave me a firm footing for a career in church music. Having been able to do so much in my three years at Worcester has opened up so many opportunities and connections that seemed unreachable to me as an applicant back in 2013.